Harissa has an incredible ability to liven up foods — I use it in all sorts of ways. Lately I’ve eaten it with sweet potatoes, hard-boiled eggs, soft-boiled eggs, poached eggs, scrambled eggs (I know, I know, a lot of eggs), zoodles, and - last night - even with anchovies. Back in the days I had no idea though. I really didn’t. I used to look at Harissa with suspicion. I should actually smack the former self of mine for that. How many tagine with charmoula sauce did I have at Cafe’ Mogador that were begging to be enriched with their homemade spicy Harissa? Stupid me. Eating tagine like I thought I knew what was what. Now I’m making up time for all the lost harissa, by slathering it on everything. 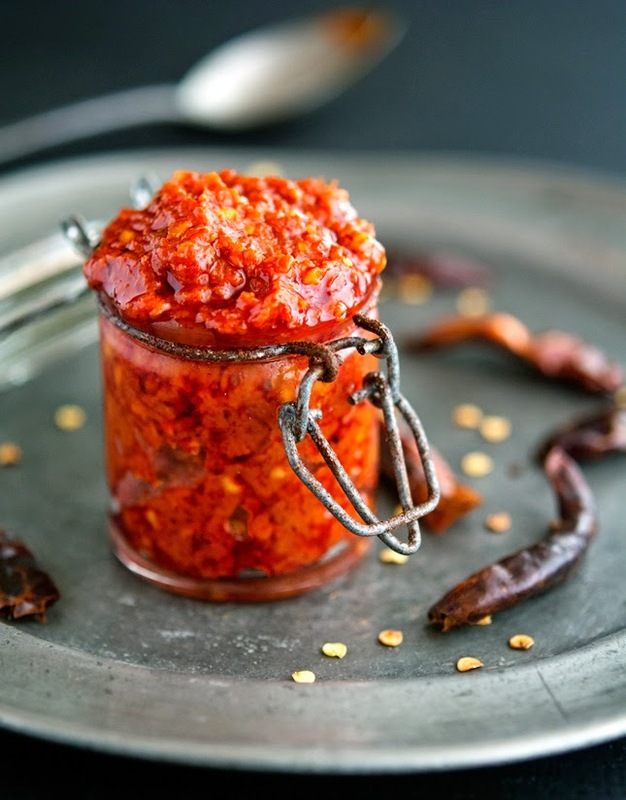 You can get harissa in tubes or small jars, but the homemade version tastes much fresher. That’s why I decided to make it at home. 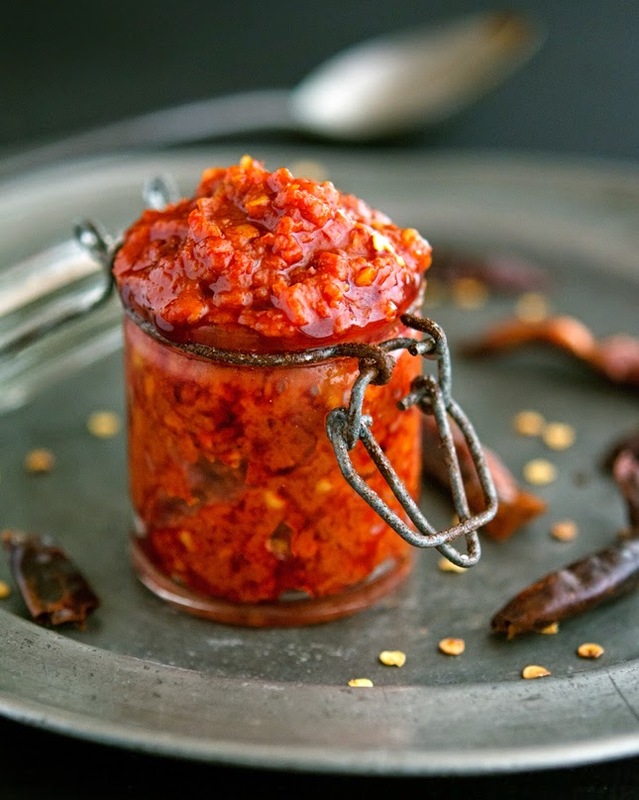 Harissa varies from neighborhood to neighborhood, as well as by city and country, but in its most basic form, is made with dried chiles, garlic, salt, and lots of olive oil. Then you can add some caraway seeds, coriander, cumin, dried mint, depending on your preference. In this version, I’ve brightened the flavors by adding a teaspoon of vinegar. Thick yet smooth, harissa pairs well with all sort of proteins, starches and vegetables. 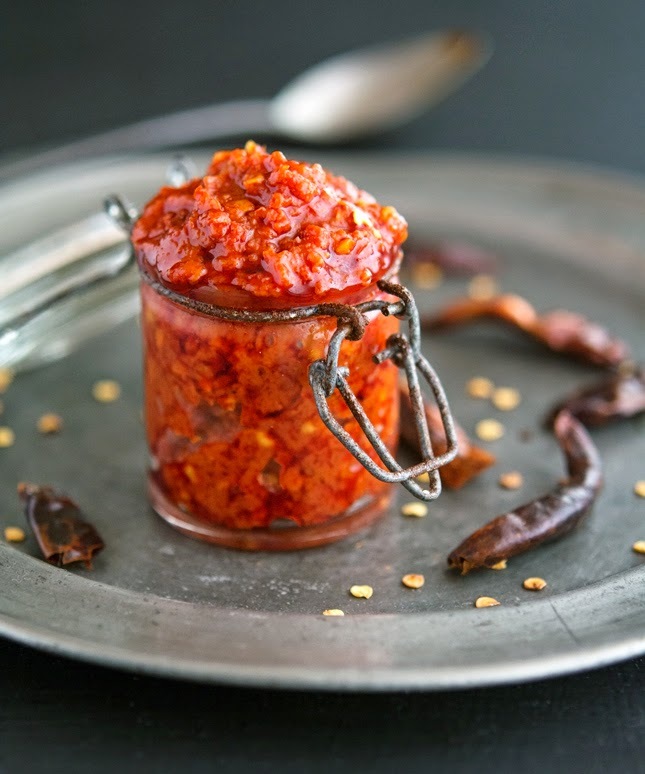 Homemade Harissa (Spicy Red Pepper Paste) Print this recipe! Note. Wear rubber gloves to stem and seed the chiles. Be also very careful not to touch your eyes or sensitive skin while you're dealing with chiles. 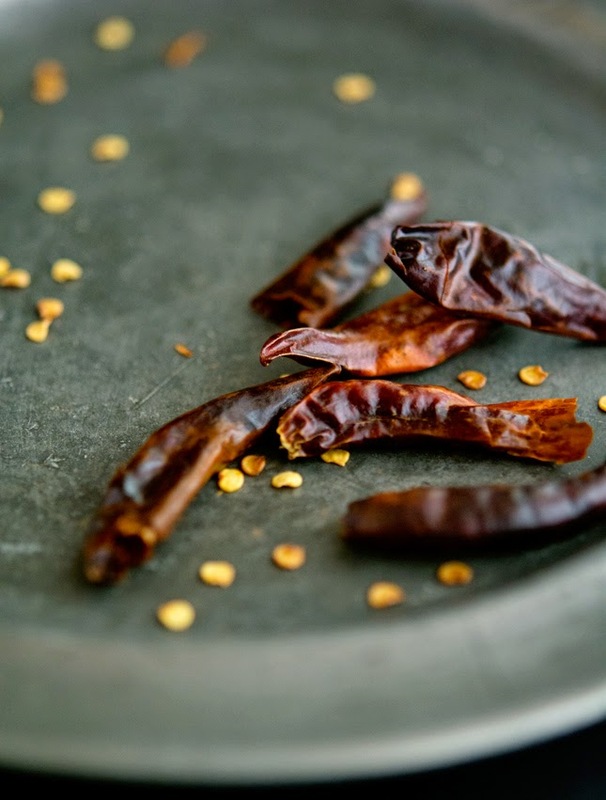 *if you can’t find these specific chiles use whatever hot dried chiles you can find. Place chiles in a bowl and cover with hot (or boiling water). Place a small plate (or a lid) over the chiles to keep them submerged in the water. Soak for 30 minutes, up to one hour, and drain. In the bowl of a food processor add garlic cloves. Process until it is all chopped and adhering to the sides of the bowl. Stop and with a spatula scrape down the sides. Add chiles, ground caraway seeds, coriander, cumin, dried mint, vinegar and salt. Process until everything is chopped and scrape down the sides. Process again, and with the machine running add 2 tablespoons of water and the olive oil. Process until the mixture is smooth, stopping to scrape down the sides if necessary. Transfer paste to a jar. Wipe the inside edges of the jar with a paper towel and cover the harissa with a film of olive oil. Refrigerate, topping off with more oil after each use. The harissa will keep up to 6 weeks in the refrigerator. One teaspoon yields 33 calories, 2 grams of fat, 2 grams of carbs, and 1 gram of protein. This looks smokin' hot and just how I like it! Great pic with the jar, too. I love to add orange peel and whirl that in the mix for mine. Adds a little citrus zip to the heat. Like your mint addition. Have a good one! Adding orange zest sounds like a great idea. I should try that! I have yet to try harissa - Mike - your pictures, recipe and description are making me feel like a nitwit for procrastinating so long! I would literally put this on everything, love the flavors! 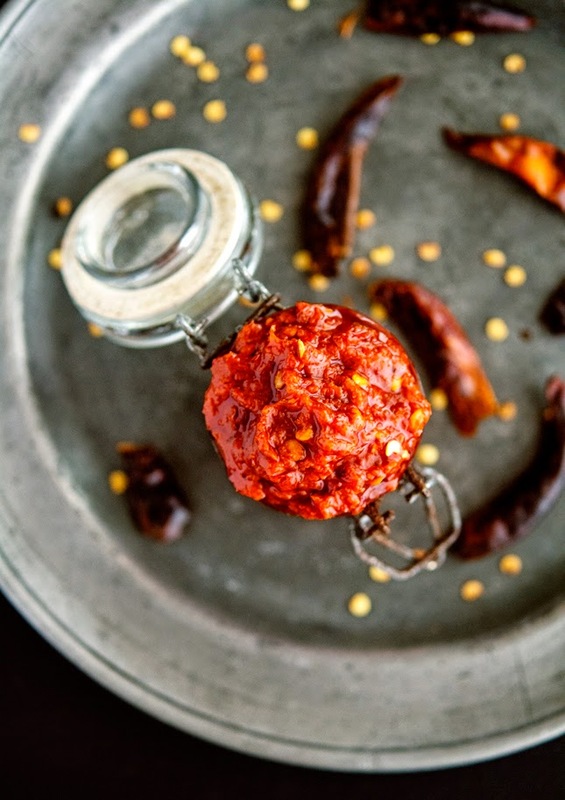 You should literally put Harissa on everything, it's that awesome! Yum. Love a little heat!! I love cooking with harissa paste but always have just bought mine from the store. Definitely need to make it myself.. your homemade version looks incredibly flavoursome! It's so easy T, you should totally try making it! Hi Mike, love harissa, this looks like a great recipe. You are on a roll here. Pinned! Oh man I gotta make this! Haha I'm totally 100% addicted to sriracha, I am the meme of the stick man injecting it into his veins! ha! I love TheOatmeal, have been a subscriber for a long time! Lao sweet and spicy hot sauce? I want to hear all about it! This looks fantastic! I'm thinking of making Harissa as gifts for the upcoming holiday. Any suggestions/words of advice for scaling up the recipe? Also, any thoughts on using a blender for this? I have a mini food processor and a full size blender, so I'm not sure which one to use. Thanks! Dude, I was just over at your sticky harissa chicken and was like... Mike must have made his own Harissa. Yup, of course he did. 'Cus this dude is legit! Can this be made with fresh jalapeños?